2015 hasn’t been a very good year for comedy so far, in our opinion. Titles like Get Hard, Vacation and The Wedding Ringer have certainly missed the mark, while others like Unfinished Business, Hot Pursuit and The Bad Education Movie are likely to end up on our end-of-year worst list. It seems, only nine months in, that the well of genuine laughter is drying up fast. 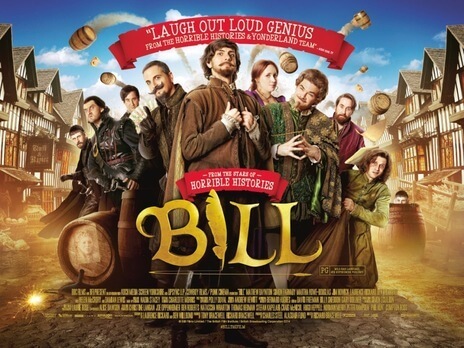 So imagine our surprise when we found out that not only is Bill, a pseudo-historical comedy from the team behind CBBC’s Horrible Histories, a refreshingly genuine laugh-out-loud riot, but is also perhaps funnier than most of the comedies we’ve actually seen this year combined – and that should really say something about how bad they’ve been. Luckily, Bill is anything but bad, and proceeds to tickle the funny bone in all the right ways. It sees a young William “Bill” Shakespeare (Matthew Baynton), a struggling playwright, set off to London to seek his destiny. Unfortunately, within the wacky representation of Elizabethan England that the film creates for us, King Phillip II of Spain (Ben Willbond) and his eccentric team of Spanish Catholic mercenaries plot to assassinate Queen Elizabeth II (Helen McCrory), and use Bill’s writing talents – via the dastardly Earl of Croydon (Simon Farnaby) and his own goals of rising within the ranks of society – to pull off their plan accordingly. Right away, you can spot that it’s about as historically accurate as Shakespeare in Love – but the film, like Horrible Histories before it, does a surprisingly good job at hinting at the true facts while just having fun with itself. There’s no straight-forward historical drama here; the intent is very much to entertain audiences of all ages whilst never taking itself too seriously. It’s a film that, unlike many of the other comedies we’ve had to sit through this year, knows exactly what it’s supposed to do and just rolls with it, creating an endless barrel of laughs whether they’re referencing the works of the real-life Shakespeare – at the start, he’s playing the lute in a band called The Mortal Coils (and yes, they do indeed “shuffle off”) – or other aspects of Elizabethan England, from the plagues which are more of an everyday nuisance than a serious illness, to the stances against Catholicism that were ripe in the era. All of them work to a truly unexpected degree, and there were moments where this reviewer was seriously trying to keep themselves from crying after laughing too much. It’s really THAT funny. Much of the humour and all-round watch-ability is down to the talented six-person ensemble (Baynton, Willbond, Farnaby, Martha Howe-Douglas, Jim Howick and Laurence Rickard) who play around 40 different roles between them. Clearly inspired by the antics of Monty Python and many other comedy troupes that have come before it, these performers seem to own every single character, no matter how minor or major they may be, and they make them endlessly fun and memorable. Baynton, aside from playing a wide-eyed and likable Bill, is also an elderly court adviser thanks to some nifty make-up (just part of the production values that are actually very good here, from the production design to even the cinematography; but we’re getting distracted…); Willbond is a great comic villain as the King of Spain, twirling fake moustache over his twirling real moustache and all; Rickard has tons of fun as the straight-faced “master of disguise” Francis Walsingham, who acts as a comic Javert type on his endless hunt for Catholics; and Farnaby, whom some viewers might recognise from a brief role in last year’s Paddington, is given some of the film’s most enjoyable moments as the hilarious comic foil (by the way, as a former resident of Crawley, for this reviewer to hear the town being name-dropped on numerous occasions for a running gag about his name – in a cinema situated in Crawley, no less – is a rather giddy experience). We’re only skimming the surface here, but trust us when we say that Bill has more laughs, more memorable characters, (probably) better production values and more of an un-cynical approach to it than most of the other comedies that have come so far this year. If you don’t want your year at the cinema to be completely laugh-free, then we highly recommend this delightfully silly romp. Bill is a laugh-a-minute family comedy that works exceptionally thanks to its genuine humour, memorable characters performed by a talented ensemble, and its amount of un-cynical fun – which puts it leagues above the majority of other comedies to have come out this year.